Swiss style relief shading depicts topography in a particularly vivid and descriptive manner. The Swiss style combines contour lines, cliff drawing, relief shading and colours in accordance with the atmospheric perspective effect. Primary candidates for the Swiss style are maps at large and medium scales. However, Eduard Imhof also applied this style at smaller scales (1:500,000 to 1:30 million). A map’s highest elevations portray the brightest lights and the darkest shadows. The strength of the shading diminishes towards the valleys. Instead of white, a medium tone depicts valley bottoms. Other relief elements must not be distorted by this tone. The depiction of every topographic feature must appear natural for a specified viewing distance. With increased distance colours become more neutral. “Canton Glarus” (section), original scale 1:50,000 (size 60 x 84 cm), eight-colour, 1889. Press / publisher: Wurster, Randegger & Co, Winterthur. 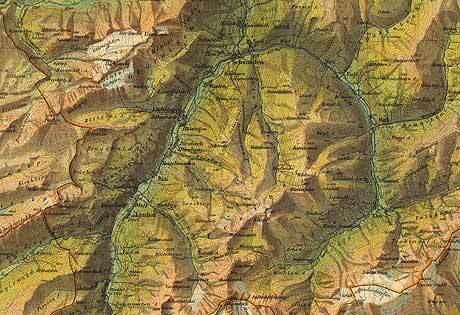 “Canton Glarus” by Fridolin Becker, is one of the earliest examples of a map produced in the Swiss style. Placing a light green tone in flat areas simulated aerial perspective, which enhanced the apparent three dimensionality of the shaded relief. In addition, depicting the highest mountain ridges with greater contrast strengthened aerial perspective. In Becker’s time, printing coloured maps depended on a technique called chromolithography (chromos means colour in Greek), which employed stones as printing plates. Printing each colour required a separate stone. To print a map, the cartographer drew an original map from which the lithographer derived colour-separated lithographic stones. Excellent coordination between the cartographer and lithographer was essential to achieve satisfying printed results. This very difficult process relied on qualified experts because of the difficulties predicting the interaction of multiple colours. Chromolithography was unique in its use of coloured originals for printing maps with shaded relief. Later printing techniques derived coloured shaded relief from monochromatic originals.